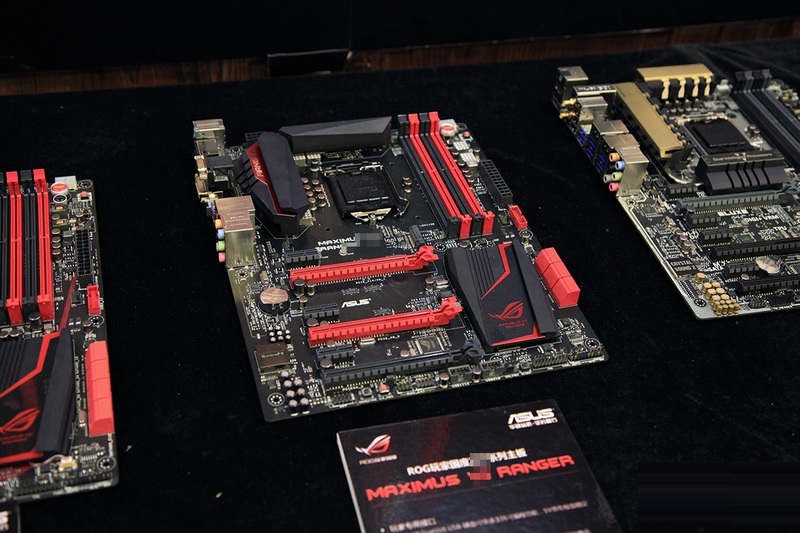 Yesterday, we showed you few of the upcoming Z97 motherboards from ASUS which include their ROG, TUF and Legacy tier products. Today, we have managed to find pictures of the entire motherboard lineup from the same event along with more detailed information. Featuring a new improved ROG design scheme, the ROG Maximus VII Hero will be featuring the latest LGA1150 socket powered by the latest 12 Phase DIGI+ VRM design. 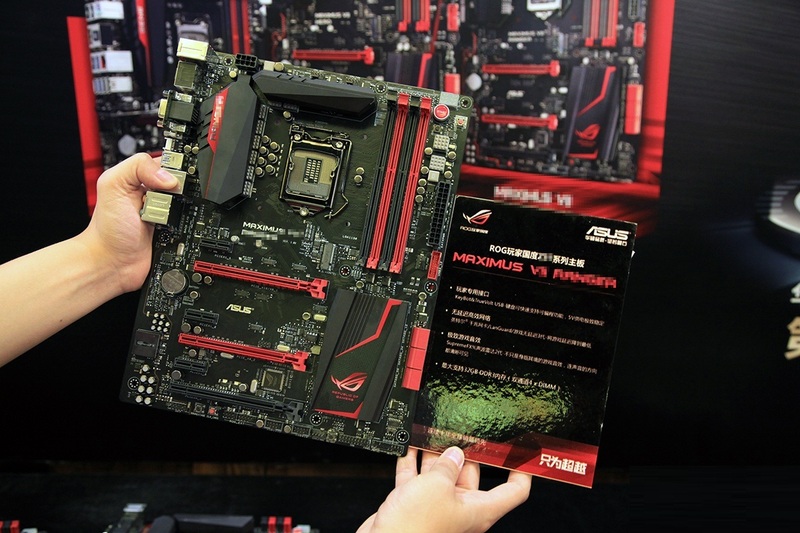 Power would be provided through an 8-Pin connector while the 24-Pin ATX connector located next to the four DDR3 DIMMs will power the rest of the mainboard. The board is equipped with overclock switches which include the OC key, On/Off and Clear CMOS switches. Rest of the board includes three PCI-e 3.0 x16 slots (x16/x16/x8 electrical), three PCI-e 3.0 x1 and a M.2 PCIe SSD interface which will support Intel’s NGFF form factor drives. For storage, ASUS has included 8 SATA 6 GB/s ports and a USB 3.0 header. The VRM and Z97 PCH are cooled by several heatsinks featuring the ROG emblem and theme. 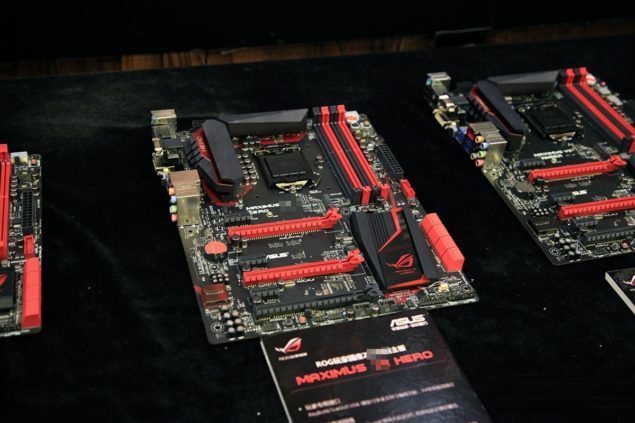 The ROG boards use a red and black color theme and the new boards stay loyal to the design. 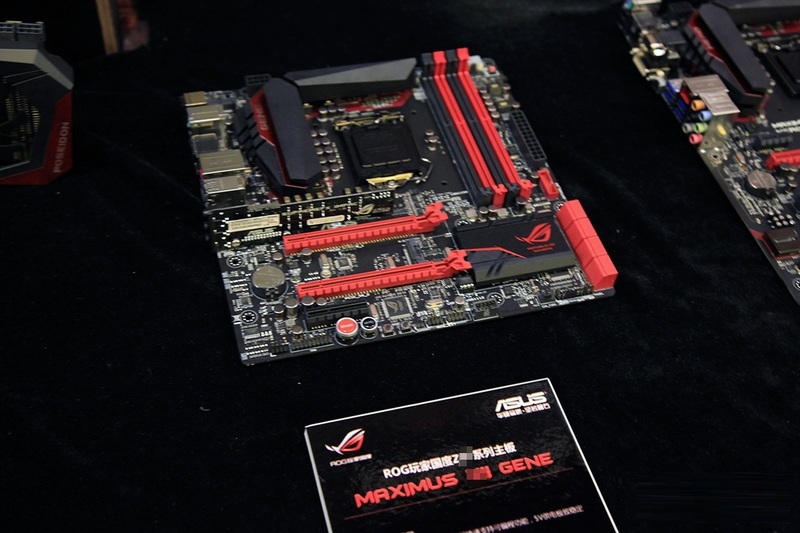 Next up is the Maximus VII Gene which is the M-ATX board made for overclockers. 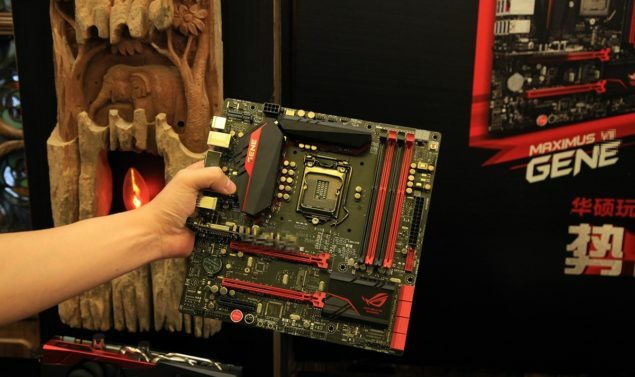 It maybe small but it retains the overclocking features of the flagship ROG Z97 motherboard, comes with two PCI-e 3.0 x16 and a PCI-e 3.0 x4 slot while storage includes 8 SATA 3 Ports. There are several I/O options an the addition of THX audio within the backpanel ports. The CPU is provided power with a 8-Pin power connector which means that the design of DIGI+ VRM is quite beefy and the cooler includes a heatpipe for superior cooling performance. The board has a M.2 PCI E SSD interface and a add-in board of some sort which is most likely the sound card since we can’t spot the Audio jack on the headers. There’s an additional add-in card slot on the top of the motherboard right next to the 8-Pin connector which could hint to a Wi-Fi / Bluetooth add in module or something similar like their Wi-Fi Go module that was available with their Z77 series motherboards. The ASUS Maximus VII Ranger is a new addition in terms of naming scheme to the ROG lineup and is a cut down board which features a 8 Phase DIGI+ VRM powered by an 8-Pin connector which provided juice to the LGA1150 socket. 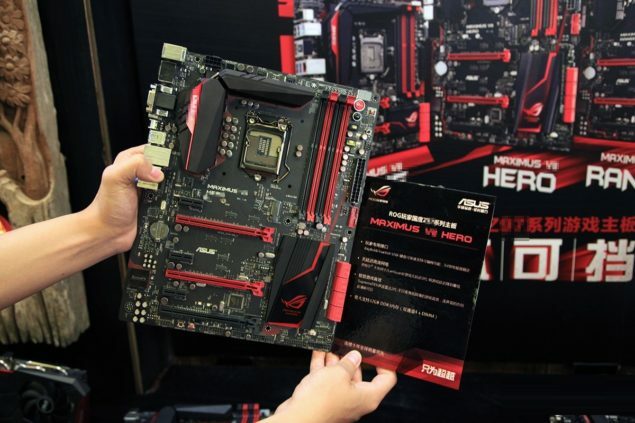 You can note that ASUS has went with a new design for chokes and VRMs which means that the board will deliver more stability and overclocking performance as compared to Z87 products of similar range from ASUS. Four DDR3 DIMMs will be able to support memory with XMP profiles for OC support. We can spot some OC and LED diagnostics switches near the 24-Pin ATX connector. Expansion slots include three PCI-e 3.0 x16, three PCI-e 3.0 x1 and a M.2 SSD slot for NGFF form factor SSDs. The large heatsink are placed on the PCH and VRM but we don’t get heatpipe solution on the Maximus VII Ranger. Storage includes six SATA 6 GB/s ports while SupremeFX chip powers the audio jack with high-quality sound output. 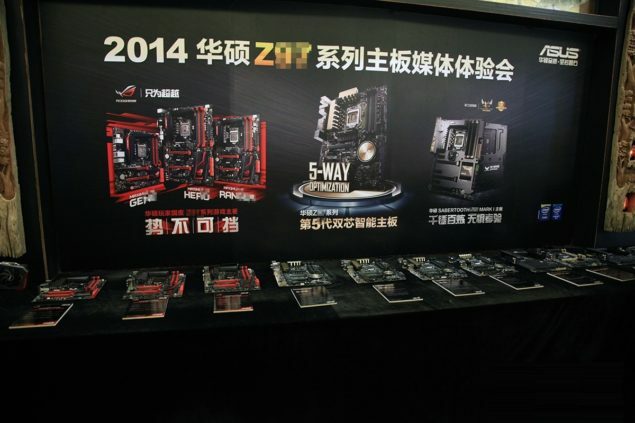 The ROG Z97 motherboards from ASUS will launch along side Haswell Refresh on 10th May 2014 and would be available at different price points. ASUS also plans to introduce their flagship Maximus VII Extreme and Maximus VII Formula motherboards over the course but we haven’t yet seen them in action so its better to wait a bit more for official launch next month.